Peter Lombard (born in Lombardy), was a student and then teacher in Paris, where he became archbishop shortly before his death in 1160. He wrote a number of commentaries and theological works in the 1140s-1150s, including this commentary of the New Testament letters of St. Paul, which became a standard text throughout the rest of the Middle Ages. 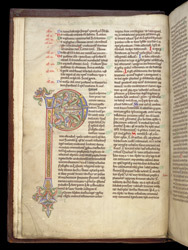 The start of the prologue is marked by a very large illuminated initial 'P', with a gold shaft and accents, and foliage modelled with striations of red, green, and blue. It forms part of a hierarchy of decoration, between the small gold initial which introduces the lists of contents, and the huge initial which introduces the main text.